Hammering is an art form in itself. When hammering is used in any wire or metal art jewelry project you must first decide on the choice of hammer(s) for that particular job. After that, the technique you use in hammering can be the make or break in the look of the project. 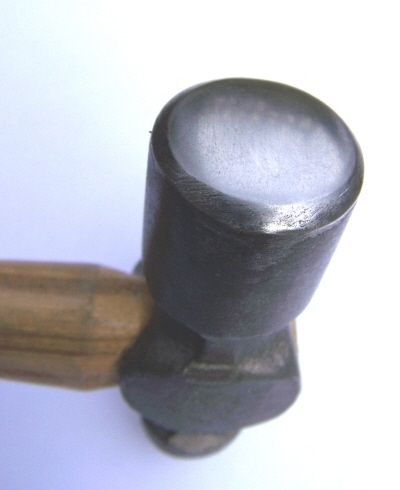 My personal favorite for most projects is the ball pein hammer and I invite you to read my complete article on the ball pein hammer to see why. Using the right hammer and using it correctly will make your hammering experiences not only more enjoyable, but you'll get more consistent and desirable results! If you have questions about the use of hammers and hammering technique, here's the place to ask 'em. → Hammering questions asked by other visitors. Ask your hammering question here. Have a question about hammering your wire or metal art jewelry? Just ask it here! Would a photo help us understand your question or situation? No problem. Click the "Choose File" button and find it on your computer..
Copper tubing into a bracelet? Return from "Hammering Q & A" page to "Jewelry Q & A" page.